Posted December 26, 2011 in kinetics. Over the years, I find myself continually returning to a subject that has fascinated me since I was twelve, when I saw my first sample of Golden Age Captain America, ostensibly drawn by the creative team of Joe Simon and Jack Kirby. The artwork had been used as a faded backdrop for a photograph of the version of Captain America that had appeared in the 1944 Republic Pictures film serial. 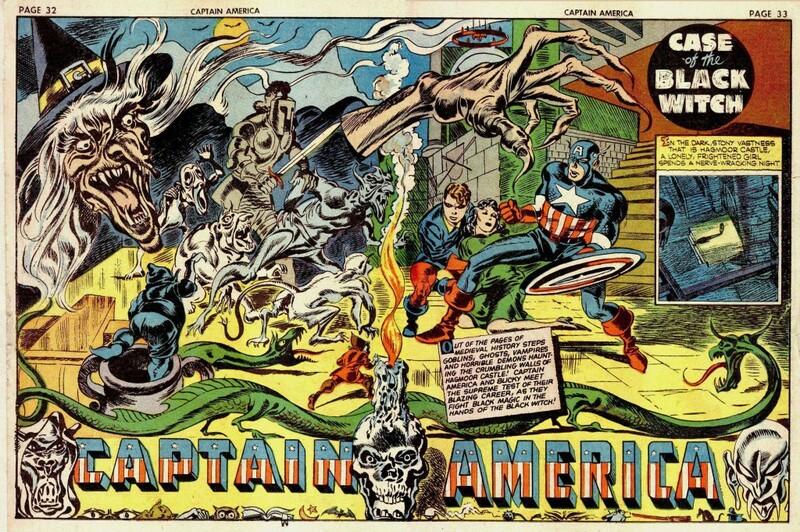 The photo- montage was from an article in a 1964 issue of Screen Thrills Illustrated, a magazine devoted to old action-adventure films and serials, which featured an article about the on-screen Captain America. The star-spangled hero was suddenly hot again because Marvel Comic’s Stan Lee and Cap’s original co-creator/artist, Jack Kirby, had just revived him. I of course had been fascinated with Kirby’s work since I’d seen his Rawhide Kid art around 1961, at nine years old. I did not hear of Joe Simon until the day I read that issue of Screen Thrills Illustrated. It took me several years to realize that Kirby and Simon not only worked together, but also had a stable of artists to assist them. On the 1940’s Captain America #1-10 pages, the mix of these artists is so jumbled across the pages that it has stumped many an expert art spotter in determining who did what. The team of Simon and Kirby featured Jack as the primary artist/writer, while Simon did writing, some layouts, some drawing and inking but primarily functioned in an editorial capacity. It is fairly certain that Kirby always penciled and also inked the majority of the splash pages, which graduated to double page spreads on some stories by issue #8. 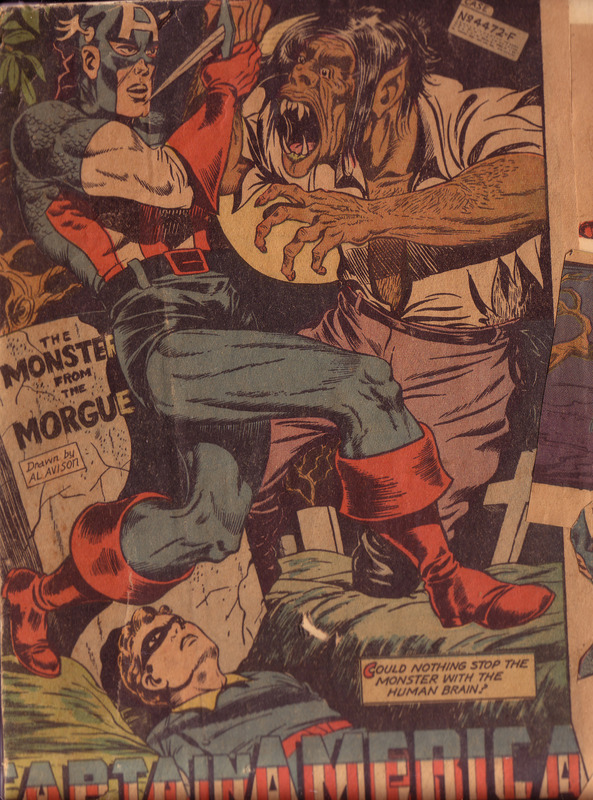 This page above is one half of the two-page spread featured in Screen Thrills, and is from a story called “The Black Witch” in Captain America #8. As mentioned, the Simon & Kirby team worked only on the first ten issues of the series, before moving to DC Comics for a more lucrative creator deal. My early teenage attempts at collecting Golden Age comic art first led me to a copy of Captain America #17, with the splash page of the lead story bearing the blurb, “Drawn by Al Avison.” It was my early familiarity with this particular artist that allowed me recognize Avison’s hand in the Black Witch story as a member of Simon and Kirby’s studio. Unfortunately, as a boy I cut up the Cap #17 issue and assembled a collage with its various panels, including a portion of the cover. Perhaps in this case it’s not so unfortunate, because I saved the collage, whereas it would have long since disposed of the actual comic during my turbulent teenage years. So we can compare the two pages, knowing that Avison was either drawing with Kirby on the Black Witch story, or tightening up Kirby layouts. At any rate, we have a clear sense of Avison’s style as distinct from the artwork on the Black Witch splash spread below, which in my opinion was drawn and inked by Jack Kirby. 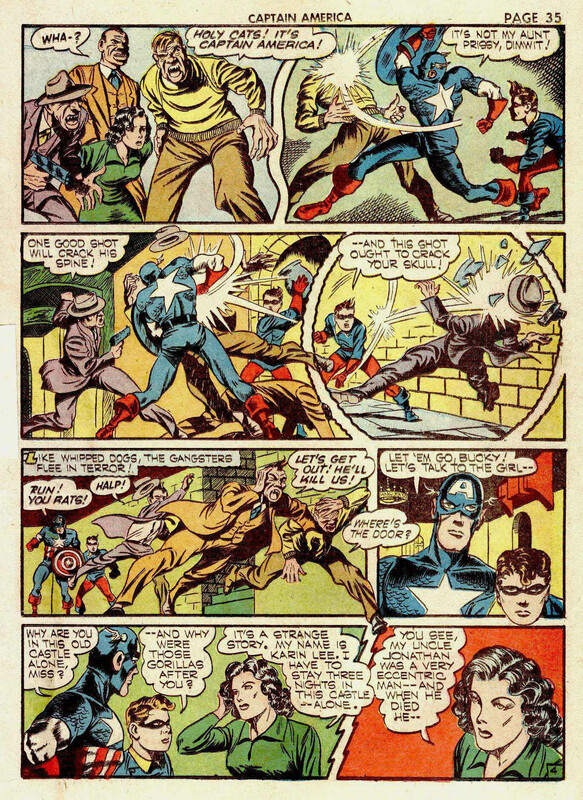 Avison’s art in Cap #17 seems nearly as confident as that of Kirby on the earlier issues. 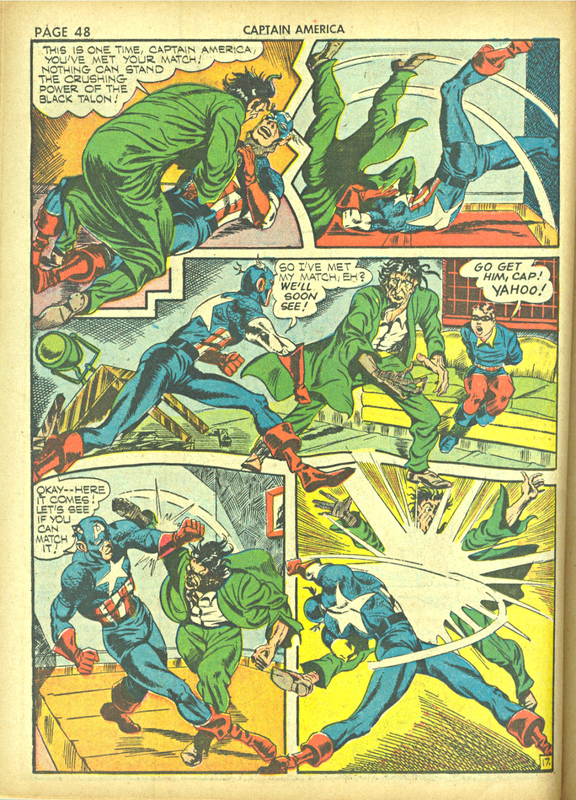 When S&K left the series, Avison was put on Captain America as the main artist, and he appears to have learned well from his tutelage with the King. His first forays starting with issue #11 weren’t particularly impressive, but he began to radically improve by around issue #13 and continued strongly on the book until Captain America #19. The question in my mind is what exactly did Avison contribute to the pages he is credited as working on with Simon and Kirby? For instance, in this story below from Cap#9, “The Black Talon,” Avison is credited with Kirby as penciler and the inker as listed as George Klein and Unknown. I had initially assumed that Avison was the inker here, because his stamp on the artwork is so strong, and it seems unlikely that he initially drew much of the figures in this sequence. At this stage of his career, Avison simply didn’t have the artistic chops to do such complex work. This action displays the anatomical proficiency of Kirby, particularly with its use of intricate three-quarter back shots, elongated musculature and foreshortening. Even the use of objects such as the sofa and table in panel 3 show a sophisticated understanding of deep space composition that Avison’s early work does not display. However, the character’s facial features, and structural finishes such as distinctive kneecaps tell me that Avison is involved somehow. If he did not ink the story, then I imagine that he tightened up Kirby’s fairly intricate pencils prior to Kiein’s inking. These matters, seemingly so unimportant continue to interest me to the degree that I am considering having a blog devoted to exploring the questions involved. I would invite various professional or simply interested laymen to give their opinion until the issues are resolved to a reasonable degree. Posted December 9, 2011 in kinetics. After more than a dozen issues, Jack Kirby and Stan Lee began to give us a back-story to The Mighty Thor in their Tales of Asgard series, beginning in Journey Into Mystery #97. Up to that point, Thor had been pitted against fairly common foes, such as Communist warlords and gangsters, with the occasional appearance of his arch nemesis, Loki. With the inception of Tales of Asgard, Thor, Loki, their father Odin and a vast pantheon of Norse gods and goddesses would emerge. Initially, Kirby’s pencils on the series were embellished by whatever artist was currently assigned to ink him, but starting with Journey Into Mystery #106, the job was given to Vince Colletta. This particular inker has rightfully taken a good deal of flak for not only erasing portions of Kirby’s pencils, but also rushing through his work and employing hack assistants to complete work on tight deadlines. In the case of his work on Tales of Asgard, Colletta’s style fit Kirby’s work and the flavor of the series to a T. Scanning this full-page panorama from Journey Into Mystery #121, one sees the brilliant compositional mind of Kirby at work once again. The block of text on the left brings the eye to the curved shape of the observation tower and the figure hanging from it. The eye then moves down the support beam to the massive, majestic suspended warrior taking up the lower left quarter of the page, but the diagonal near his knee draws the eye back upward to the right, where it encounters another curved shape which brings us back to the relatively small figure of Thor. What is amazing is that despite all the action on the page, because of multiple visual cues we always end up with Thor as the focal point. Looking at this drawing, I cannot help but think of Hal Foster, an artist that Kirby has mentioned as one of his main influences. Foster’s Tarzan comic strip revolutionized the use of the dynamic figure, and was used as a model for scores of artists to polish their anatomical drawing skills. However, it was the creator/artist’s full page Prince Valiant Sunday strip beginning in 1937 that Kirby was channeling in his treatment of Tales of Asgard. At first glance, in comparison to Kirby, Foster’s work may seem a trifle precious, in the sense of being overly refined, but beneath the surface there is a robustness to be found. There is also a strong sense of composition in Foster’s use of figures in deep space that Kirby would have certainly appreciated. What is most striking is the beauty of the archaic world that Foster has conjured with his incredible attention to detail. 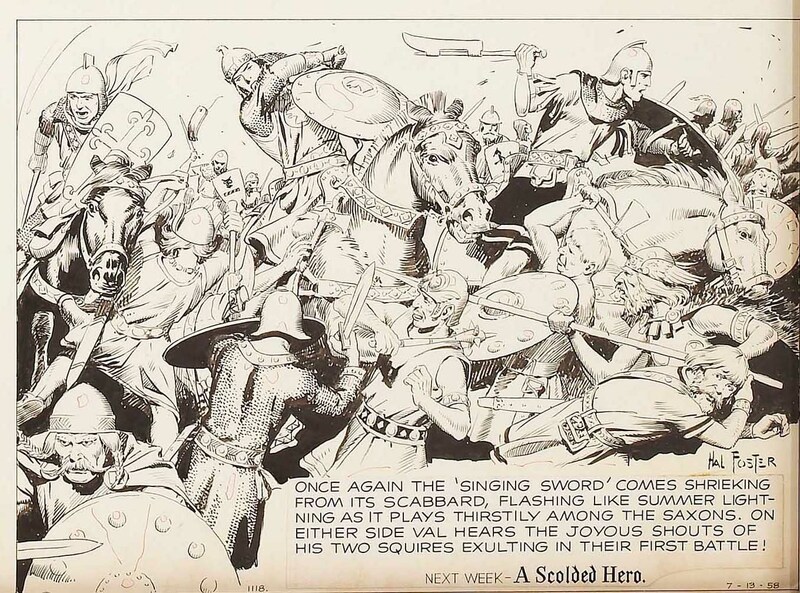 In Prince Valiant, Foster took great liberties with the contrasting cultures that surrounded his hero, combining various periods of English history to invent his own version of the age of King Arthur. 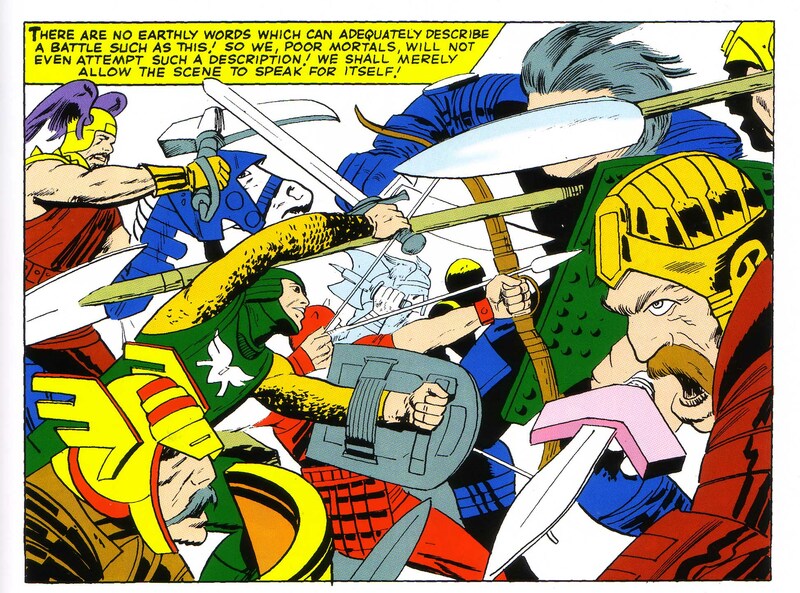 It is this atmosphere of the mixture of medieval British nobility and chivalry, combined with the rough hewn cultures of Vikings and Saxons that Kirby adapts for his Tales of Asgard, and which Lee further embellishes with faux Shakespearean dialog. We see in this panel drawn by Foster that as with Kirby’s work, there is a great deal of complexity in the relationship of the figures to one another. We can easily recognize the Big O here. The viewer’s eye enters the panel on the left with the first horseman. His scarf and shield bring us to the second warrior, whose raised arm points us to the third soldier’s battle ax. His curved shield brings us further rightward and down to the horse’s nose and then around to the wing helmeted Norseman with the lance that, points us back left to the central foot soldiers to complete the circle. It is difficult to know whether it was Foster’s influence that pointed Kirby in this direction, but we can clearly see similarities in the King’s approach to scenes involving figures in deep space compositions. In this panel below from Journey Into Mystery #112, we see a wonderfully complex interplay of foreground and background figures locked in battle. We first notice the warrior on the left wielding an beak shaped ax, which leads our eye rightward to the arm of the gray haired swordsman. We follow the curve of his shoulders to the gold helmeted figure, where the triangular hilt guard on his dagger moves our eye to the shield of the chain mailed figure and further right to the wing helmeted head in profile on the left. It is this sort of complex and interwoven melee that Foster and Kirby are both masters of. 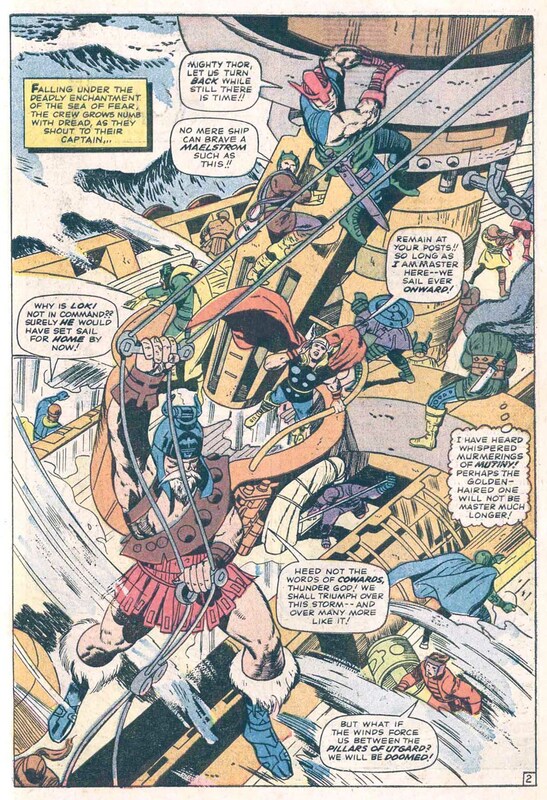 Again, there are clear stylistic differences between the work of Jack Kirby and Hal Foster, but we can clearly see here that the King has borrowed from his elder both in technique and historical flavor.